Excerpt from the promotional material of the Divine Soul Travel Agency (Milky Way Division), the metaphorical sponsor of the real book, HOW TO MAKE THE MOST OF YOUR EARTH EXPERIENCE (14 Principles for Living Unconditional Love). Question: What does it take to be truly happy in your short time on Earth? Glenn: “The real key to happiness on Earth is sitting right there in your heart of hearts, waiting to be rediscovered. Question: Why have you come? Glenn: “Each of us is born into this earth experience with a Divine Soul purpose and mission. I’ve come first to help people remember their Divine Soul and consciously use that inborn power to live the life they came here to live. So far, Glenn has authored two spiritual books, with more on the way. 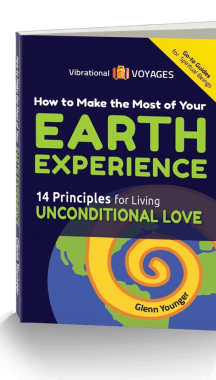 “How to Make the Most of Your Earth Experience—14 Principles for Living Unconditional Love” is the quintessential guide for understanding how the alchemy of Divine Light manifests. If you’ve ever flirted with the Law of Attraction, this will take you to the next level. 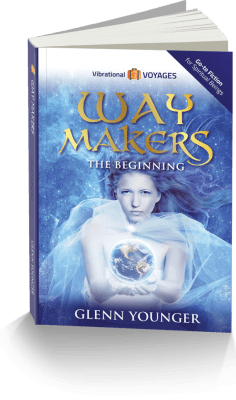 “Waymakers:The Beginning” puts the alchemy of Unconditional Love into story form with a cast of characters you can relate to as they struggle with power games, Divine Missions, and good old human romance. Because she walks her talk… and talks her walk… Glenn attracts individual clients from all over the world, at all levels of society. Her practical yet light approach to spirituality has a way of relaxing the ego-intellect to open itself to new possibilities. Before you know it, the voice of your Inner Critic transforms into your Inner Cheerleader and biggest fan. She punctuates it with a grin. By directing the power of Divine Light Vibrations to fulfill her desire to “see and experience what’s out there”, Glenn has literally traveled the world over. Professionally, work on board luxury cruise ships started at the ripe young age of twenty-two. As Cruise Consultant, she visited well over 90 countries, some of which no longer exist. Much later in life, she circled back around and returned to the luxury cruise industry as Cruise Director. She’s seen the blue of glaciers in Alaska… Norway… and all the way to the tip of South America. Tropical breezes throughout the Pacific have warmed her bones as she’s danced to the local drumbeats. In the Baltic, she experienced first hand the communism of Russia in the 80’s and watched its shift into a free market in the early 2000’s, all with the opulent backdrop of palaces of the Czars. Independent travels have taken Glenn all through the backwaters of India as well as its deserts while sleeping under the stars on a camel’s blanket… the heights of Machu Picchu and the Nazca lines of Peru… the green rolling hills of New Zealand and its rocky coasts… the exotic neighborhoods of Singapore. She’s experienced the earth energy of the Hawaiian Islands… as well as underwater realms of planet earth while diving around the world. (That’s a real live Amazonian spider crawling up her arm by the way. We’re not sure if she should get credit for being curious, courageous, or just a little crazy. You decide). On the local American front, when she was just thirty she traveled from coast to coast while giving her talks to Fortune 500 companies on goal setting and time management as an NSA speaker. In addition—and with many acting credits behind her on stage, television and radio—her creativity took her throughout the US as well as continental Europe and Italy. Glenn’s favorite travels, though, are the metaphysical ones in consciousness—in a conscious Universe made up of infinite Divine Light. As a writer and spiritual transformation coach, she doesn’t believe in espousing theory. Rather, she resides in the knowledge that comes through practice and experience. She encourages her clients and fellow Waymakers to do the same. Question: What’s the best place you’ve ever visited? Of all the voyages I’ve made here on earth—and of all the places I’ve visited and been changed by—the journey into my Divine Heart has been the single most important one. Question: Who were your most important teachers over the last thirty years? 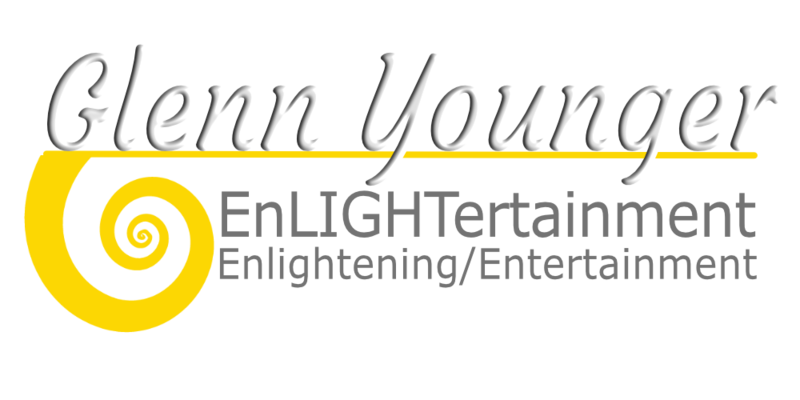 Jim Goure of the Light Center who taught her to use the Light in her heart. It was thanks to his teaching—and a car accident one snowy afternoon when she saw the physical world emanating Divine Light—that she opened herself back up to remembering how we’re all Divine Souls creating human experiences. You can read more about it in her book, “How to Make the Most of Your Earth Experience —14 Principles for Living Unconditional Love”. Katherine Jarvis, a retired Unity Minister, shared her knowledge of the Kabbalah and other ancient texts from the time of Hermes Trismegistus. They helped Glenn understand the timelessness of heart knowledge. Drunvalo Melchizadek, with his MerKaBa meditation and his Earth/Wind/Heart workshops on sacred geometry expanded her consciousness even deeper. Then, through a lot of trial and error, she finally connected the dots on how to open yourself up to infinity. Communing with others about how Divine Light flows. Click to tweet if it speaks to you. … and let it sing out to you with unabashed happiness from the deepest regions of your heart. Question: When did you first start teaching spiritual principles? Metaphysically, her first course geared for beginners on “Intuition: Recognizing and Understanding Your Inner Voice” was in 1998. The theater company and school she founded in Italy—Il Teatro Dell’Imprevisto—emphasized spiritual and personal growth in all the games. Dedicated to Rah Neil (the protagonist in Waymakers: The Beginning), Glenn recently started Waymakers Academy in honor of all Divine Souls whose human ego-intellects have forgotten their innate power. Its courses and services are specifically geared for New Thought Thinkers and experienced Self-Explorers. For discipline of the mind, Glenn has studied yoga, Reiki, Neurolinguistic Programming, and the MerKaBa Meditation using sacred geometry. She is currently studying Tai Chi. Naturally, she meditates daily. The Basic Activation of Divine Light Vibrations are now so ingrained, she works with them as habitually as she breathes the air. Look towards your Infinite Divine Soul Knowing. Let the alchemy of Divine Light Vibrations do the work. Question: It sounds easy enough, but the real question is: how do you do that? Today, Glenn is still traveling the world over, opening up doorways in consciousness for those who call on her. Everything she does is to help people send their Inner Critic on permanent vacation so they can rediscover the inborn power of their Divine Soul Knowing. Live their Love. Pass it on. Create the life they came here to live. Her books, online courses, and 1-on-1 Divine Soul Sessions are all designed to be fun, practical, and concrete. Letting go of the emotional scars of the past. Discovering your Divine Soul Purpose and Mission. Taking your spiritual practice to the next level. Living your life fully. Freely. Joyfully. Joyously. Unlimited. Uninhibited. On your terms. She’s a great fan of riding the wave of laughter to new horizons. Question: You’ve done so much. Do you have any dreams left to live? These two books are a good place to start. Discover your deeper Truths through fiction… non-fiction… or both. Delve into a good book. Journey into new horizons. When Rah’s missing jewelry box suddenly reappears against all logical explanation, her search for answers sets off a chain reaction with unforeseen consequences. She discovers the hard way her inborn power to create whatever she wants. The good. The bad. The painful. The pleasurable. Join Rah—and her ensemble of friends and enemies—as she makes her way through power games of cosmic proportions to new illuminations of freedom and joy. IF… you’re ready to take life to the next level and shine your Light like you’ve always dreamed, this jewel of a guidebook is for you. Release old habits…transform past conditioning to new freedoms… understand the power games people play… and send your Inner Critic on permanent vacation. All with the alchemy of Unconditional Love. Before you know it, you’ll be living in a world with broader horizons than you’ve yet imagined during your earth visit. Say #ByeByeInnerCritic with your FREE jumpstart mini-course.